Cheers. I'm at a decent 65%. And here's our first job! It took me until April to get a job, and there is only 4 games left of the season, but the team is currently 4th (when predicted 14th) 3 points off 2nd to qualify for the playoffs, and 5 points off the top spot, so with a bit of luck we may go up. However with very little time to get used to my way of doing things, I don't hold too much hope, which may not necessarily be a bad thing as we don't want to go up too soon. What worries me is the club is currently -£250k, so the finances are not looking good. 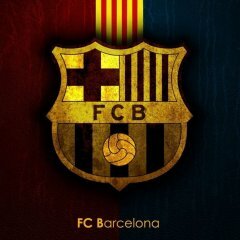 Hope to use the club as a stepping stone onto a bigger South African club. Until the last few matches Ghana had done very well under my management, qualifying easily for this ACON by winning our first 5 group matches. Recently though our form has been suspect, and we’ve only picked up 1 point from our first 2 World Cup qualifiers. The thing about managing an African nation is you usually play fairly weak nations until the major tournaments. We look to have an easy group, albeit alongside 2nd ranked African nation Egypt, but that usually means that you get a tough next round. Anyway, the ACON is basically a lottery, and at least we have a ticket. Vs Egypt 2-2 A decent start, and I thought we were unlucky not to win. On the other hand, our weak defence was shown up. Mind you, this result started to look a lot worse when Gabon won their first 2 matches, including against Egypt, and locked up one of the 2 qualifying spots. Gabon!?! Turns out they have a couple of really good midfielders. Vs Guinea 2-1 We went a goal down, and I started to think that this tournament was about to turn into a complete fiasco. We pulled a goal back, but it took us until the 87th minute to get the winner with a long range swing of the boot. So much for this being an easy group. Vs Gabon 3-0. A convincing victory. Egypt drew their last match so I think there’ll be a job vacancy there at the end of the tournament. Next up is DR Congo. If they live up to their world ranking, it will be a tough match, but their results in the group stage were pretty ropy. At 3-1 up at halftime we were coasting and I was already preparing for the semi-final. However the team can’t defend and it all went to pieces. Slightly disappointing, but Ghana really aren’t one of the best teams in the continent. It was just the best job I could get 2 years ago when my rep was far lower. I doubt I’ll be sacked, but I want to try to move on to a better nation anyway. I’m in 2 minds though. My team is young. The oldest first teamer is 29, and then they’re all 27 or younger. I have a promising goalie and striker. I have no good defenders at all. One of my first XI in that position is more of a defensive midfielder, but there’s a couple of youths who potentially could be ok in that position in a couple of years time. I was about to quit, but I think we may be a better prospect in 2 years, although if I don’t get sacked after the ACON, I probably will be when we fail to qualify for the World Cup. I'll pretty much have to win out the rest of the group. Anyway, looking forward to my season with Uni de Chile. The team's much better. I doubt we'll win the Lib, but I should just be able to instant result through the league and cup, stomping on Colo Colo's dreams and making them sack another manager. Colo Colo are one of four teams in the world I'd never manage, and the other three are just because they're rivals of teams I support. UPDATE - DR Congo won the ACON. Annoying. If we could just have held on to that 3-1 lead. Anyway, I wasn't sacked. Well, we got promoted! 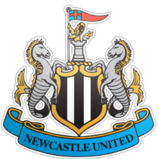 However I feel the press, fans and board have been a bit generous in their praise for me It was the previous manager who had exceeded expectations and got them in the position in the first place, I just saw them over the line in the last 4 league games and comfortably through the play offs. We won 3 of our last games taking to the final game of the season where the title could've gone to us, Stellenbosch FC, or Black Leopards. Unfortunately we were playing Stellenbosch FC who beat us 2-1 at their place, the title went to Black Leopards, but we were still in the play offs with Stellenbosch and Golden Arrows from the league above. We improved slightly on our final day defeat and drew 1-1 away to Stellenbosch in the first play off game, before a 2-0 win away to Golden Arrows, 1-0 at home to Stellenbosch and 2-0 at home to Golden Arrows again saw us comfortably promoted in the playoff league. Unfortunately the club is still an absolute mess financially and there doesn't seem to be an awful lot I can do about it. A lot of contracts players were expiring, I allowed a lot of them to leave as they were in the reserves or just not good enough to be playing regularly, which should help with the wage bill. I resigned two of the star players from the season back on loan, top scorer Sidney Masana from Bloem Celtic, and Sphumuelele Mbulu from Orlando Pirates, and trying to bring in some more players on free transfers to bolster the squad. We had to relocate to a different stadium as our old one didn't meet league requirements, however we had a huge average attendance of 303 last season so not sure how much of a difference that is going to make anyway. 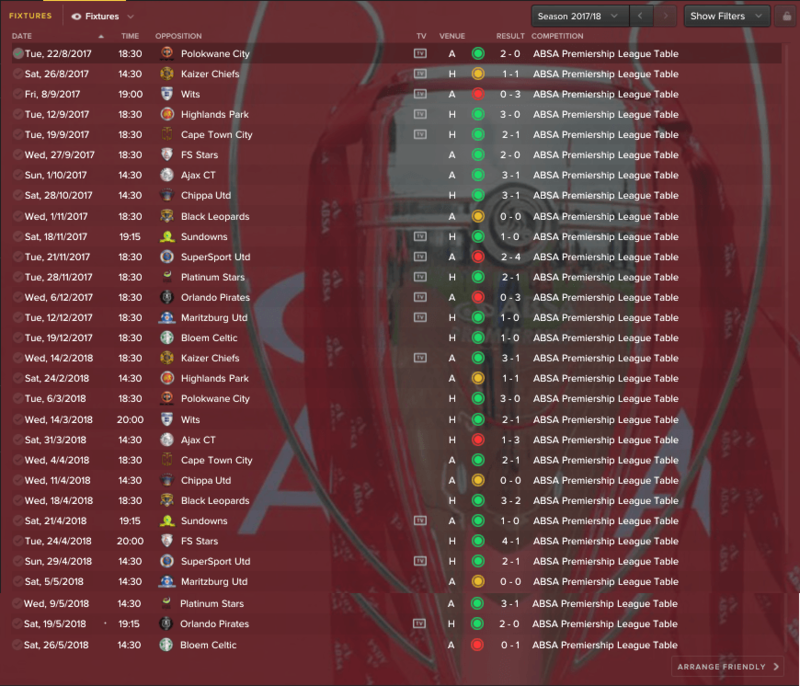 Going to be a very tough season ahead for sure, but hopefully we can stay away from the relegation places, I can earn a coaching badge, and hopefully my reputation increase enough to get a bigger job. 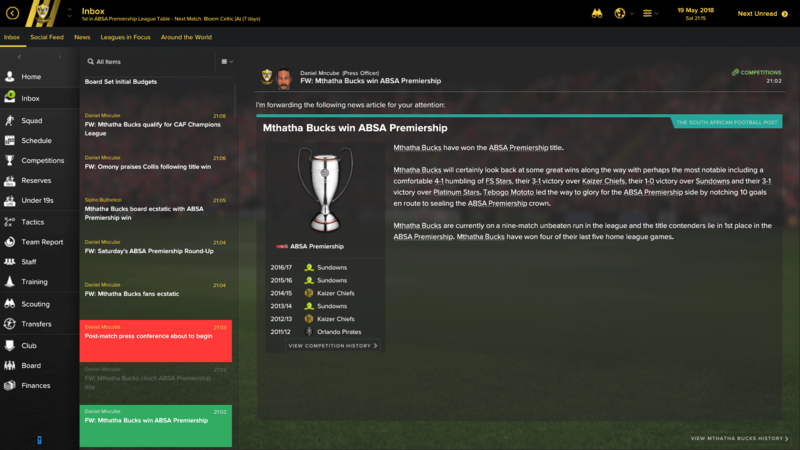 16/17	 	Mthatha Bucks       3rd		Promoted to ABSA Premiership. Was only in charge for 4 league games and the playoffs. @Collzy - Good job securing promotion. Little tip for next season: you don't have to register u21s even if they're foreign in the league. My starting XI currently has 6 non-SA players in it, as I've brought in some u21foreigners on loan. You'll be surprised at the impact they can have on the squad. What leagues one should load up from Asia for this challenge? Depends where you are in the challenge. I'd say China, South Korea and Australia. Unbelievable Jeff! I wasn't quite expecting a season like this! Maybe I overestimated the quality in the league, but we were predicted to finish rock bottom with odds of 1000/1 to win the league, but we only went and done it! I didn't think we were particularly great throughout the season, our defence often seemed shakey, we never really outclassed anyone, but the "big teams" in the league were all pretty awful this year, we just remained consistent throughout and pulled off a great victory. We were superb at home, but if we were going to slip up, it was our away form which was disappointing, this needs to improve next year as I can't see the other teams being so inconsistent next time around. This was disappointing however in comparison to the league season. It started off well, albeit we had lower league opposition in every round up until the semi's, where we got Kaizer Chiefs, one of the teams I expected to put up a proper challenge for the league. Frankly, they destroyed us 4-0, we were awful, and that was the end of the cup run. Amazingly we were still named as the overachievers of the competition, presumably because of our low reputation (despite being top of the league at this point). Overall, a highly successful season, defying the odds to win the league at first time of asking. Our finances are in a much better way now due to the success too, however annoyingly I still haven't got a coaching badge. Everytime I ask the board deny it either due to "financial reasons" or "my prescence is needed in training", quite frustrating. Next season we will be in the African Champions League (whenever this starts), so I will be staying until then at least. 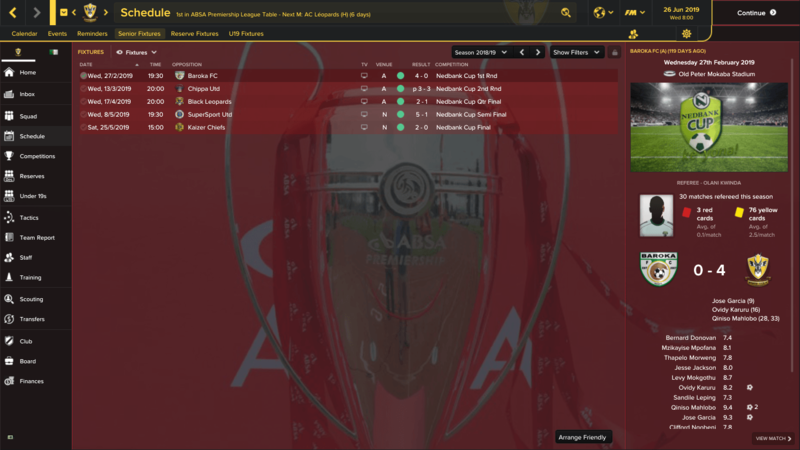 With the league accomplished that will be my main aim going forward, however a cup victory would be nice too. I'm not sure I need much in the way of signings, the guys I bought in were all very good, as well as promoting a couple of youngsters who exceeded expectations. I will need to replace my loanees however, as their parent clubs do not want them out on loan again and would rather sell them, unfortunately they're asking for too much to make a permanent deal viable, so there are a few spaces in the squad available. 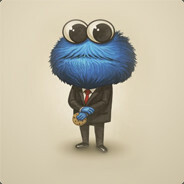 I would like to get an international job soon, just to boost my reputation a bit more, preferably an Asian team however there hasn't been any jobs going in my time in game. Hopefully be given the permission to start my badges soon too. 17/18		Mthatha Bucks	    1st		Winners of ABSA Premiership. Semi-final of Nedbank Cup. African CL qualification. When I took over Juventus we had played 19 games and found ourselves in 7th but we were only 5 points from AC Milan who were top. 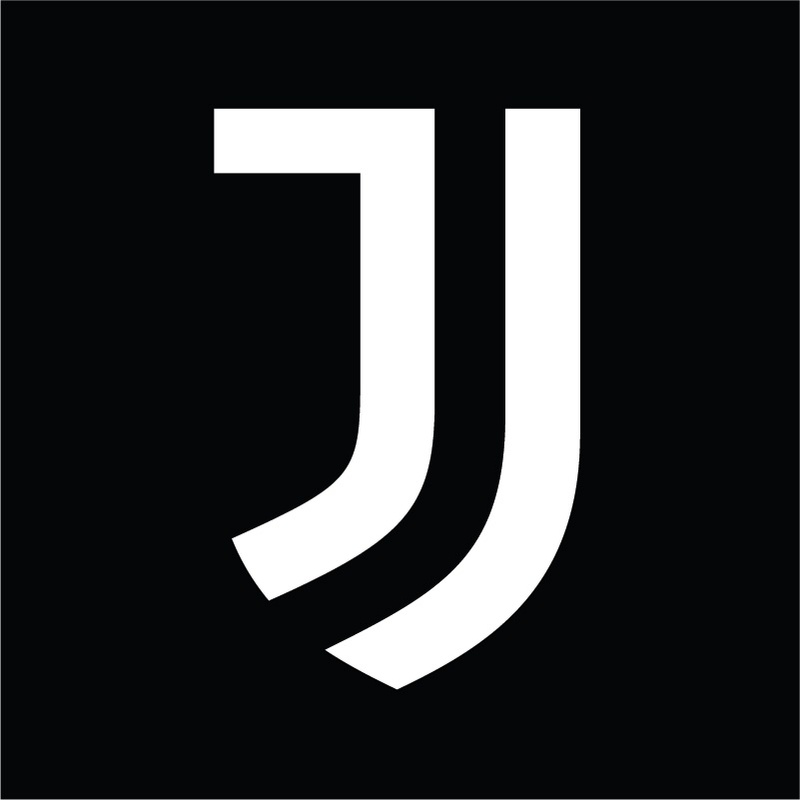 We were also into the Knockout Rounds of the Europa League and in the 1st Round of the Italian Cup so lot's to play for. The squad was amazing so I knew we had a good chance of a few trophies! Serie A - We went on one hell of a run losing only 1 games in the last 19 but a couple of rubbish draws at the end meant with 2 games left we sat 3 points behind Milan. In the next game we beat Torino 3-0 and AC lost to Inter 3-0 meaning we went into the final game level on points but 2nd due to our results against AC. Looking at the final game it was going to need a miracle to overtake them, we won our game but so did AC as they hammered Crotone. We had ended 2nd but overall the 2nd half of the season will brilliant and gives me hope for a title push next season. 24/25	Cruz Azul		1st/6th		Nothing Won! When does the African Champions League take place? Looking at Sundowns previous fixtures, it seems to run from Feb-Oct time which 1) seems a ridiculous setup and 2) means I have to stay at this club longer than I kind of want to. Got an issue where most my squads contracts expire in a years time (June next year) but most of them want around 6k a week wages now (which is about 6* at least the amount they're currently on). I could find I don't have a squad capable of winning it by the time it comes to the later knock outs. 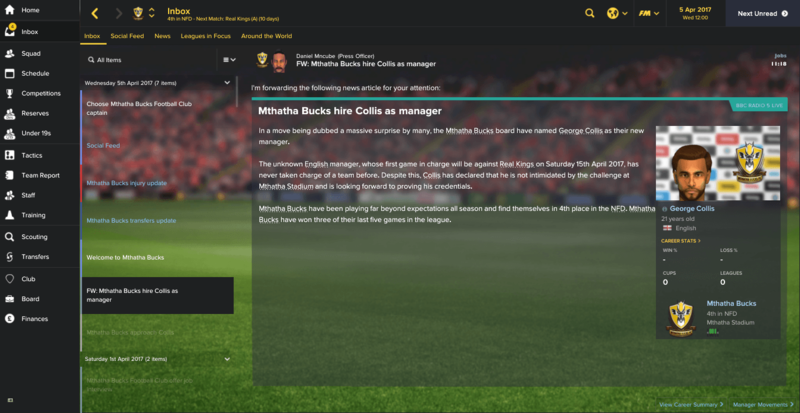 May have to move onto a different South African club if the contract issues stays the same. @Collzy yeah the champions league runs Feb-Oct same as the Asian one. Means staying an extra few months/season. Currently 3rd in the World Rankings and top of their World Cup 2034 Qualifying Group (just). @darren1983 Thanks, looks like I'll hang around in SA for a bit longer. That's awful to hear about your laptop I've enjoyed reading your updates, it'd be a shame to lose you, especially as I'm just getting started! 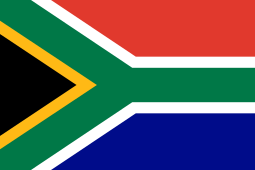 @Collzy South Africa can certainly be a pain in the arse. Not only will it take you that minimum season and a half to win the Champions League, but I think you only get one chance to register the players. Basically, if any of your players want to leave, get rid of them and replace them now, because you need to have a team that wants to stay for the whole CL when it starts. south Africa is essentially the 6th mandatory league. I mean, you don't have to win it, but you have to manage a S African team for at least 1 match, and it's the most frustrating one, but it's a rite of passage all of us have to endure. @darren1983 Sorry to hear about the hard drive, but it wouldn't have helped you if you had saved the game on the cloud, because it often doesn't work. I suggest that everybody saves their games to an external (USB) drive at least once a season. Anyway, hope you start again, as I was enjoying you being part of this business we call show-off. @Cheekybananafm Well done on your first piece of Italiaware. Hope it's the first of many. 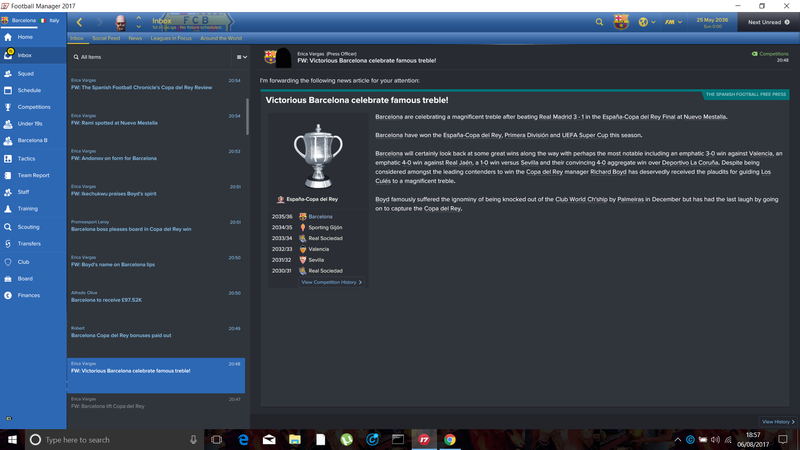 Won the Spanish league and cup double with Barcelona, also finally top of the English managers Hall Of Fame. 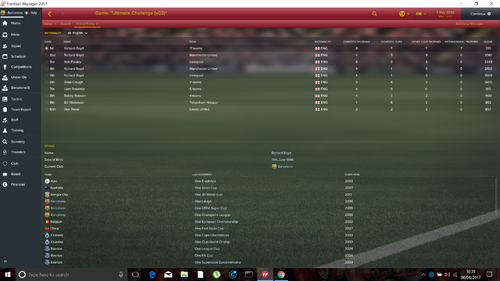 Resigned from Barcelona and applied for the West Ham job, should get it with all of my success. 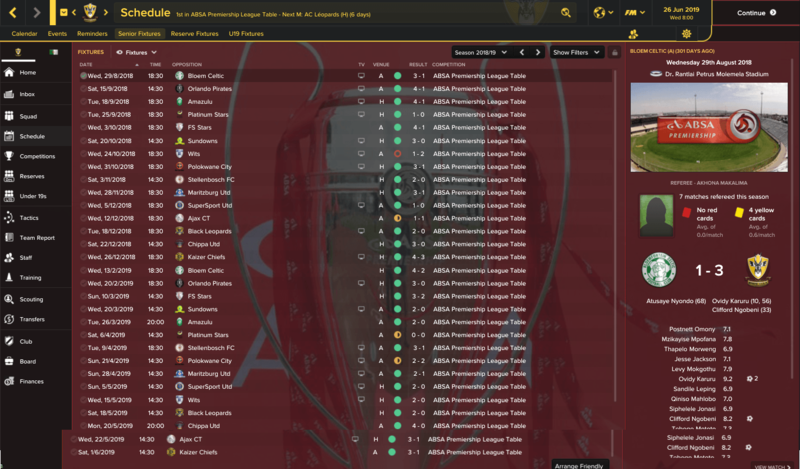 I stayed to see how we would do in the Libertadores. It didn’t look in our first game when we were thrashed by a Brazilian side, but things got much better from there on. Unfortunately we were knocked out in the quarter finals by Vitoria of Brazil on penalties after drawing 2 matches, both of which we probably should have won. Mind you, Boca have won the Lib 2 years in a row now, so maybe it’s not the Brazilian sides we should be worrying about. I did apply to a few Brazilian clubs and didn’t even get an interview, but I’m happy to give it another shot with U de Chile anyway. It’s going to be tough though because of the leagues rules stipulating (amongst various other restrictions) that I can only have 5 foreigners over 21 (or 20) in the league, and 1 of my current young foreigners has just come of age. Not that winning the league is a problem. I was worried when my 2 opening instant resulted league matches resulted in just 1 point, but it was actually a cakewalk. 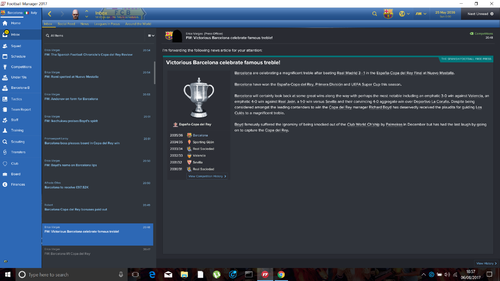 I completed my second league cup double in a row, once again beating Uni de Concepcion in the final. Next year don’t bother making the trip. However, if my foreigners aren’t registered for the league, they might start getting restless. Anyway, my team next year is unlikely to be significantly better, but I think we still have an outside shot at the Lib. On the international side, I left Ghana for Nigeria. I don’t have to worry about being sacked if Nigeria don’t make the World Cup, as my Ghana side beat them in the previous round. Top Goalscorer – Munoz– 38 I needed a striker to play alongside my current top scorer Mora, and Munoz did the business. Best Average Rating Munoz 7.58. MVP – It’s not a one man team, and last year’s MVP Romario is still the guy I’m envisaging for my challenge XI, but Munoz obviously helped. 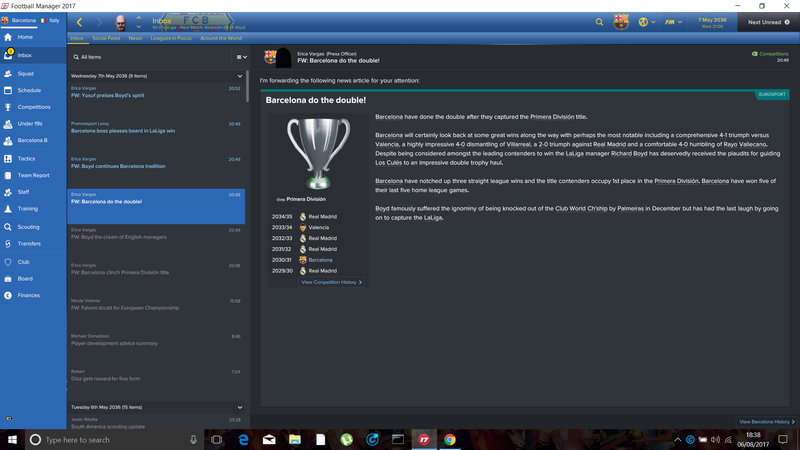 2021	U de Chile				1st		Another league / cup double. Lib Q/F knocked out on penalties. Much better. Much, much better. We started the season in our customary way, losing to Kaizer Chiefs in the 'Be the coach' game, and following that up with a semi final loss in the Super 8 tournament. If I were the authorities I'd be looking at match fixing, its become that regular. That said, we started the league on fire, only losing once (4-2 to Golden Arrows of all teams) in the first half of the season. We amassed 34 points by the halfway stage, which put us level with SuperSport Utd. We resumed with a defeat to Sundowns, and then won 7 on the bounce, before a horrible run of 3 points from 5 games. Fortunately, SuperSport Utd also had a dodgy spell, and so we found ourselves a single point clear of them with 2 games to go. The first of those games? SuperSport Utd. Away. In the past three seasons, they've only lost 3 home league games. My silver lining was the fact that one of them was against me. Up steps Tshifiwa Mashishi and completely dominates the game. Firstly he puts us ahead with an absolute screamer, and then sent up Pablo Acosta to seal a memorable win, and, more importantly, the title! Cup-wise, we meekly surrendered in the last 8 of the Knockout Cup, but my squad players were far more successful in the FA Cup. Stars of Africa, Black Leopards, Magesi FC and Jomo Cosmos were all beaten on our way to the final. Our opponents were obviously Kaizer Chiefs. They took the lead just before the half hour mark from the penalty spot, before we missed a penalty of our own before the break. 1-0 down, I changed a couple of things, and star striker Ashley April levelled the game with 20 minutes to go. As I have already won a cup in South Africa, I decided to go for broke, throwing on an extra striker. We both had chances, and then they hit the post in the last minute. That wasn't the end of the drama, as we broke, smashing a ball down the line before Lynden Gooch, in his final appearance before retirement, flashed a cross across the face of the goal, begging someone to finish it off. And finish it off April did, thumping the ball past the keeper and sparking scenes of jubilation! Is there anything better than a last minute winner to win a cup final against your local rivals? However, whilst the trophy successes have been pleasing, this season was all about the Champions League. AS Tempete Mocaf were brushed aside 9-0 on aggregate, before a tough tie against Club Africain. winners of the Champions League only two years ago. A solid 2-0 home win was followed up by finding ourselves 2-0 down inside 20 minutes away. The game levelled out, before Pablo Acosta scored an 88th minute goal to put us through 3-2 on aggregate. I was expecting an easier tie in the third round, and we actually got TP Mazembe, the team who came runners up to Club Africain two years ago. A 3-2 win away from home in the first leg set us up perfectly, before finishing the job with a professional 2-0 win at home, putting us in the group stage (which obviously falls next season). Jeffrey Khumalo, Fabricio Carlos and Tshifiwa Mashishi have all had excellent seasons. Centre back Khumalo averaged 7.51, and was a rock at the back. New signing Carlos pitched in with 8 goals and 12 assists in 20 games from AMR, and I've already spoken about the influence Mashishi has had. Its a strange one, as he forced his way into the side when Liam Jordan got injured, and made the AMC role his own. What next? Well, the group stages of the Champions League! I'm also hoping to get back into international management soon. The World Cup is about to happen, so I'm hoping for some managerial casualties! 2018 Sligo Rovers 1st League winners! 2019 Tianjin 1st League winners! 2020 Tianjin 8th FA Cup winners! Champions League winners! 2021 Montreal 4th League (MLS Cup) winners! 2023 Montreal N/A NACL winners! 2023 Palmeiras 9th Brazilian Cup winners! 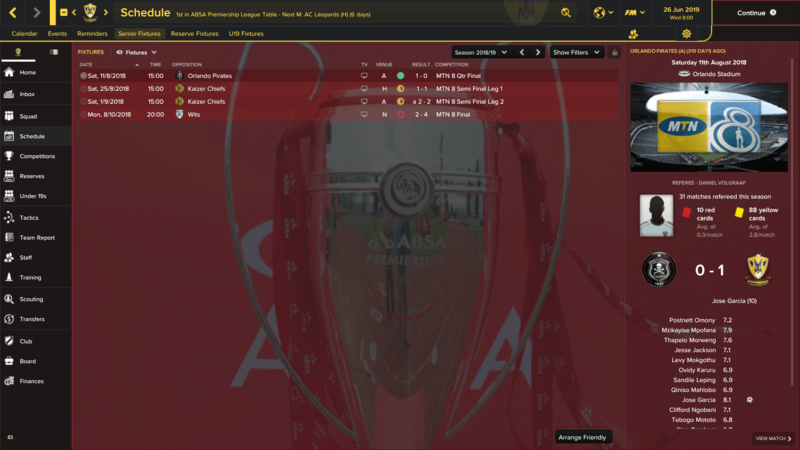 2024/25 Ajax 1st League winners! 2026/27 Orlando Pirates 8th Took over with 10 games to go. 2027/28 Orlando Pirates 4th SA Knockout Cup winners! 2028/29 Orlando Pirates 2nd SA FA Cup winners! 2029/30 Orlando Pirates 1st League Winners! SA FA Cup winners! 2023 Ivory Coast African Cup of Nations winners! 2027 USA North American Gold Cup winners! 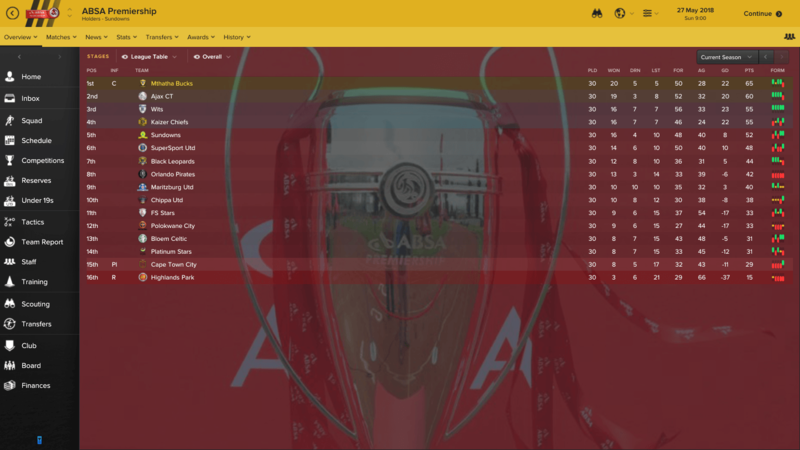 So after the miracle of getting the Norwich job while at Stevenage last season, I got them relegated from the Premier League with only a few games to go. Therefore the objective was getting straight back up from the Championship. I'll firstly say that following the 2018 World Cup I got the Poland job. I've done alright there this season but only 2 games into the Euro 2020 qualifying round so not going to bang on too much about my progress with Poland. I will start by saying I completely revamped the squad. The squad was pretty unbalanced with a lot of aging players on high wages and to be honest just a huge squad. I literally kept 2 players from the previous season, Louis Thompson and James Maddison. I sold £88 million worth of players and spend £45.5 million as well as slashing the wage bill by £450k a week. Something I like doing on Football Manager is being a bit of a Harry Redknapp-esque Wheeler Dealer (largely because the money in football at the moment is truly disturbing). My signing of the season was Adryan, at £3.1 million from Hangzhou, he got me 20 goals and 8 assists in 43 games, pretty good return for attacking midfielder. Also worth a mention was Silvan Widmer from Granada, I signed the right back for £4.2 million and he ended up with 6 goals, 4 assists from 26 games (Injury kept the appearances a little lower) and an average rating of 7.39. Now I have to fend off AC Milan who are after him. I smashed the league to be honest, we finished 1st place with 92 points, 15 points clear of play off's. It was a slow start however I think with all the revamp of the squad once it came together we were a force. This was truly gutting. I got to the semi finals and drew Arsenal. It was quite an incredible 2 legged affair. We won the 1st leg at the Emirates 5-1. 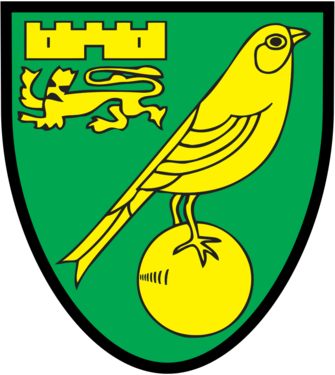 However lost the 2nd leg at Carrow Road 5-0. I was absolutely gutted and probably a little complacent with such a big lead going into the 2nd leg. We live and learn though. 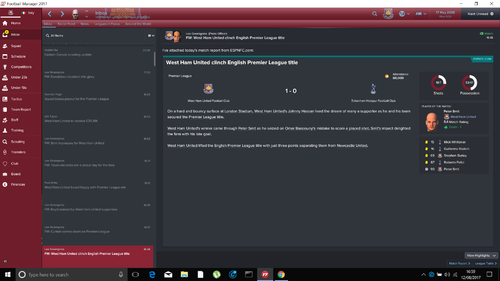 Nothing special about the FA Cup this year, I lost 3-1 to West Ham in the 5th round. Next season in the Premier League, I'm not going to make too many changes, I've already signed Chancel Mbemba, Ronaldo Viera and also Lovre Kalinic. Other than maybe a few young players I don't think I'll be signing anyone else. Hopefully after a good start I may get a job offer. Will be hard leaving my beloved Norwich but I don't think I'm going to progress much with the challenge staying here. 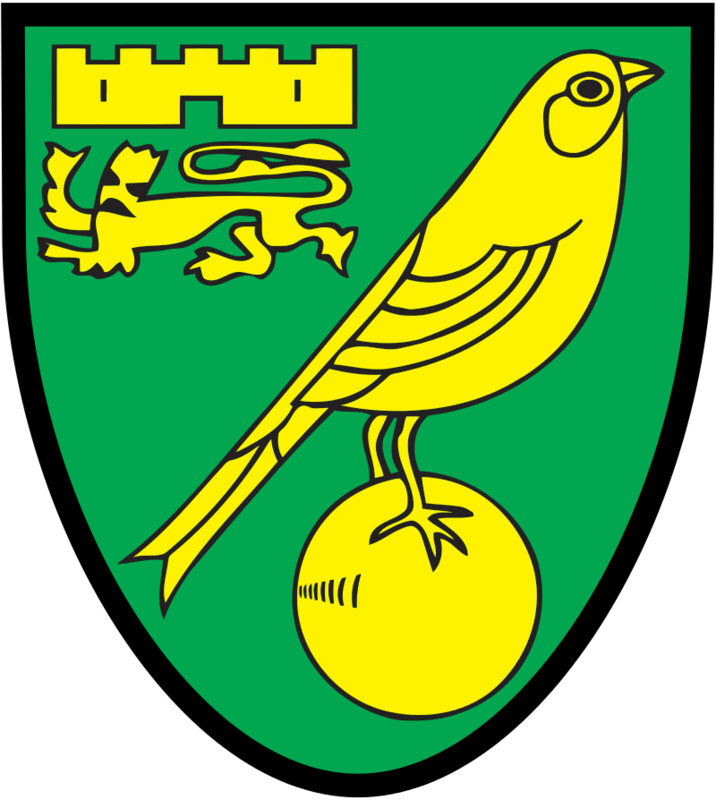 2018/19| Norwich          |1st      | CHAMPIONS! Job decisions are a lot easier to make if you win the damn champions leagues. I've been offered an interview with Jeonbuk (in Korea) and I need to go there at some point to pick up the champions league I left China without, but I also need the libertadores. No point winning more than 10 domestic leagues, so I'll stay, but I'll be fed up if I vike some of the champions leagues and end up short on leagues or cups. We got it. The last club tropy. The Spanish cup. 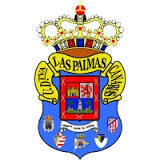 It was all plain sailing up to the final, as I avoided Barca, Real and Atletico, and no other team in Spain is much of a challenge over the two legs. Fittingly I faced my main nemesis Real in the final. We went 3-0 up at the break but they pegged it back to 3-2 and my center back David “not so” Smart decided to get himself sent off with 10 to go, but we held on. I completed the clean sweep with a thumping 100 points in the league, and by thumping Spurs 4-0 in the CL final. Here it is, crucial time again at a major international tournament, but maybe, just maybe we can get over the line this time. We are on a great run, undefeated since that World Cup final defeat 4 years ago, first in world rankings and favourites for the tournament. I hope I can win it this time as most of my first-teamers will be past their best or retired by the time the next world cup comes round. Russia, Iran and Ivory Coast should make for a straightforward enough group. So much for the group being a walk in the park. We tried hard to break Russia down, but they put out one of those super-defensive tactics and we couldn’t get past it. We even almost conceded from a counter at the death. A decent win but our performance was definitely so-so. Have these lads decide to bottle it in the crucial tournament, England-style? Finally hitting a bit of form. We ended up having the same points, goal difference and goals scored as Russia, but got second place in the group. Luckily Denmark somehow topped their group so we’re playing against them next. The non-EU teams are getting knocked out left, right and center so there might be a few deja-vu matches against the strong European teams in the latter stages of this tournament. We actually went behind in the 11th minute, in what proved to be Denmark’s only shot on target in the match. 34-year world veteran Meakin equalised before a brace from Tierney, who spent his whole career at Watford, sealed the deal. Some unlikely heroes there. More may be on the way, as we face Scotland in the quarters. Scotland 0 – 1 England. Goals: Crook. It was an unexpectedly tight game as the Scots nullified most of our threat, until my reserve fullback came up with a 20-yard screamer on the 76th minute to send us through. Old foes Spain are next. Ok, my national rep must be seriously high because even Spain chose to play some hideous defensive 4-5-1 formation against us. Spain pegged us back twice with amazing solo goals, the last one especially annoying as it came in the 89th minute. But not to worry, we turned our dominance into goals and came through in extra time, avoiding the dreaded penalties. We play Italy in what I hope will be a third-time-lucky World Cup final for me. This is just so typical. Hopes dashed once again, in classic England style; not that I am exonerating myself either… Here we have Italy, ranked 11th in the world, not good but not great, a team we should easily beat. They play some weird 3-5-2 formation, something I hardly ever encountered and it’s a tough game. My leftback Cooper gives away a needless penalty, and we’re 1-0 down. We work hard and equalise, only for the antichrist Cooper to get himself sent off 4 minutes into the second half. Italy score the winner from a corner after a rebound, and nothing much else happens. So here we have it, looks like the World Cup is my bogey tournament and unfortunately it’s only every 4 years… Looks like I will be competing with @Fadedaf for the "masochist of the year" prize in this challenge. Other than throwing my laptop out of the window, I don’t have THAT many ideas. Applied for the Spain job but got rejected – maybe it’s that bug again which comes about if you apply a real names fix. Other available teams seem bereft of quality, so be sticking with good old England for the near future and see which prospects come through now that my good players are ageing and retiring. 2028       |   Fluminese           |  Brazil Ser. A      |   8       |         n/a          |   Joined 1/3 through the season. Qualified for Copa Lib. 2024/25    |   Jamaica        |  Gold Cup      |   Winners! Serie A - After a brilliant run when I took over last season to finish us 2nd I knew we had a huge chance of winning the league this season. And so it was as we absolutely smashed everyone, an unbeaten season, only 5 draws in 38 games, 104 points, only 85 goals but only 18 conceded. We won the title with 7 games to spare. Amazing! Italian Cup - Another cup win, our 2nd in a row. We were never troubled in any round and we beat Genoa 4-1 in the final. Champions League - Poor, poor, poor! We had a group where I felt we could easily get out of. OM, Arsenal and CSKA Moskow. we managed to play absolutely shocking, winning only 1 games, drawing 3 and losing 2, we ended 3rd and dropped down to the Europa League. Europa League - Our 3rd trophy of the season. We breezed through to the final beating Bordeaux (Rd 1), Fiorentina (Rd 2), Atletico Madrid (Quarters) and Wolfsburg (Semis), we then played Napoli in the final and beat them 4-1. What next? - It would be amazing to stay here and win the Champions League but I need to keep moving and tick off some more of the European League titles, I'm sure I'll have another big job where I can have a chance of the Champions League at some point. So at the moment I won't quit but will apply for other jobs if and when they come up. Next up however is the 2034 World Cup with Italy! Group Stage - We had a pretty easy draw to be honest, Saudi Arabia were first up and it was an absolute kick in as we won the game 5-0, next up was Ukraine and again it was plain sailing as we ended up 2-0 winners. We had qualified with a game to spare so I rested some players in the Peru game, it was quite tight but we scored 2 late goals to win the game 2-0, 3 wins, 3 clean sheets but it was about to get a lot tougher. Last 16 - As always when I play FM I seem to get a tough draw no matter how well I do in the Group Stage and this time was no different. We were in Group G and in H were Brazil and Spain, Brazil topped the group which meant we had the tough test of Spain. The game was cagey, it ended 0-0 and after extra time it went to penalties. Spain missed their first 2, we scored our first 2, Spain scored, we missed, Spain scored, we missed! 2-2 going into the final penalty. Spain MISSED!! Up stepped my main Striker Valter and he smashed it past the keeper to send us through! Semis - Mexico had got past Holland in the round before so it was always going to be a tough test. Goals just before half time and right at the end of the game sent us through with a comfy 2-0 win. Final - This is massive! The nerves are getting to me! The 2nd semi final had finished and Portugal had beaten France 2-0. Portugal are ranked 3rd in the World and had got past not only France but Brazil and Argentina as well, we are ranked 2nd so it was going to be a brilliant but incredibly tough game. Portugal scored early and they looked really good but just before half time to got back onto level terms. We came out in the 2nd half like a train and on 49 mins we scored to make it 2-1. Portugal came at us but we held out. The whistle blew and we had done it! 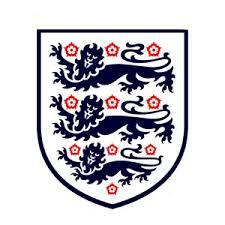 WORLD CUP WINNERS!!!!!!!!!!!!! Amazing, we only conceded 1 goal all tournament and bar the Spain game looked brilliant all the way until the final. Next up is the European Championships, lets hope I tick that one off as well! @dkouv Gutted for you. I was rooting for you all the way, other than the second or two I saw you were playing Scotland, but I after that, I was team dkouv. Fadedaf and yourself are certainly providing a scary story for anyone taking on this challenge. I'm going to have to introduce a Hall of Misery, but which of you could I put on top? Are you sure the two of you aren't reloading those finals until you lose? That's cheating! @Cheekybananafm On a more settling note, you continue to roll on. so when you get your 5 big euro titles, you're going to have a 10th league to win, plus a few cups. 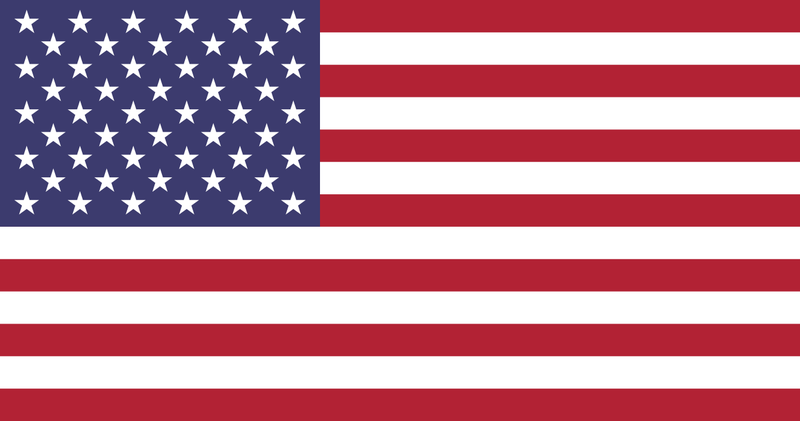 Do you have a nation in mind, or are you just going to go for the nations with low hanging cups? @YellowLittle Well done bouncing straight back up. Be interesting to see what (if any good) job interviews or offers you receive. @numero uno gunner Good luck in the group stages, and well done picking up the league which hopefully augers well. @Ronaldo Beckham Getting into the finishing straight (strait?) now. Is this the first FM challenge you've done? @vikeologistOnly need 4 cups so Germany, France, Spain and England league and cup double with make it 9 leagues and 10 cups. I was thinking last night about the 10th league, may re-add Scotland back as I had unfinished business only winning the cup with Hibs or maybe another British/Irish one. Really not sure yet! @vikeologist - Yes it is the first challenge I have ever done, I just want to finish it asap now as I have so many teams I want to start a fresh save with like AC Milan, Everton, Huddersfield etc. 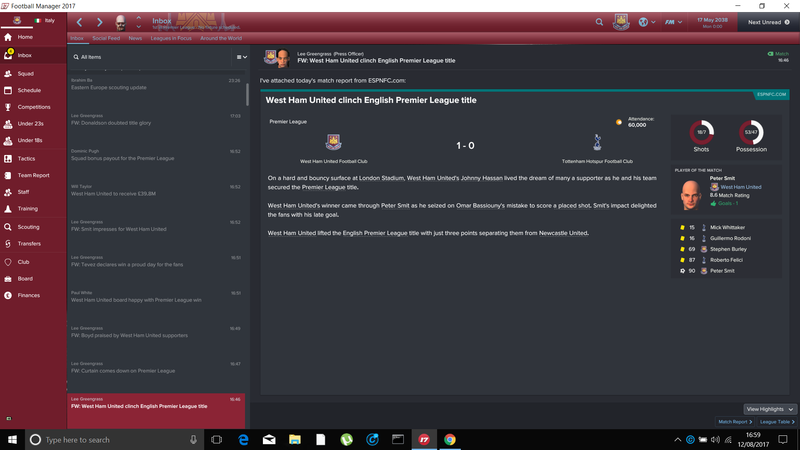 I took over as West Ham manager but could only manage 3rd place, 2nd place team Man United's manager left so I have applied for the job, hopefully I win the Premiership with Man United or West Ham and I can move on as I need to start winning trophies. I am baffled right now, so I was 1/5 favourite to take over Manchester United, I even got to the point of them asking me to suggest changes which 99% of the time means you got the job so I was excited to take over the club I support in real life for Man United to reject me a 2nd time in my career, they gave it to Zidane in the end, oh well I guess I will stick with West Ham for a 2nd year, I hope I pip Man Utd for the title now out of revenge for them rejecting me lol. It turns out that it was worth sticking around after all. 4 wins and 2 draws was enough to see us through the group stages of the Champions League as group winners. This was handy, as it meant that we avoided SuperSport Utd, who comfortably topped the other group. Instead, we faced Vita Club in the last four. After Mashisihi missed a penalty just before the half hour mark, I was under the impression it might be one of those games in the first leg away from home. However, he took it as a personal insult that his penalty had been saved, and put us ahead before half time. He then set up a second, which was disallowed for offside. At the hour mark, we were cruising. By full time, we lost 2-1. I still don't know how. This only spurred Mashishi on, and in the second leg he made 2 and scored 2 as we brushed Vita Club aside 4-1, to set up the inevitable final against SuperSport Utd. Away from home in the first leg, it was a game of few chances, with Ashley April putting us ahead, before they levelled things up. 1-1 at half time became 1-1 at full time, and we came back home knowing a win, or even a 0-0 draw would be enough. Alejandro Pena put us in front, before Mashishi smashed in a penalty, celebrating like Stuart Pearce at Euro 96 afterwards. 2-0 up, and looking comfortable, SuperSport then had a man sent off. Surely even we couldn't blow it from here? By the hour mark, they were level on the night, and ahead on away goals. I threw caution to the wind, and up stepped Pena again to fire home after some scrappy defending. They came at us in the last ten minutes, before we hit them on the counter through Fabricio Carlos to seal the Champions League! Now I can finally leave South Africa, if I can land another job that is. However, I decided to have a crack at the Club World Cup before leaving, and a 4-1 win over ES Tunis in the quarter final set up a semi final against Flamengo. They were the better team, and despite missing a penalty, went in at half time 1-0 up thanks to a wonder strike from one of their midfielders. Fabricio Carlos equalised for us in the 53rd minute, but we weren't level for long before they scored again. And that was that. I'm now looking for a new job both domestically and internationally. I'm leaving Orlando Pirates top of the league, four points clear with a game in hand. The squad I've built is good enough to win the league again. For me and this challenge, Europe will hopefully come calling now. 2030 Orlando Pirates 1st Champions League winners! Well done to everyone on their progress. It's taken until the end of the season but I've finally got a job and my god what a job it is! I had the choice of 2. German Champions Schalke or French Champs PSG. I went with PSG mainly due to the fact I had more money to spend and feel I have a much better chance of winning the Champions League. This should be fun!!! Quick question - My reputation is now at 70% (and weirdly didn't increase after winning the African Champions League) and I'm getting turned down left, right and centre. Honestly, its ridiculous. What sort of jobs were people getting with reputations around 70%? Bayern, Roma, Inter, Barcelona, Lyon, Monaco, Man City, Liverpool - I'd fully expect to be rejected by these clubs with a reputation at 70%, but threw an application in anyway. CSKA Moscow, Sunderland, Swansea, Bordeaux, Koln, Hoffenheim, Villareal, Valencia, Hertha Berlin - I would've hoped to have at least got an interview at some of these. Rangers, Dinamo Moscow, Celtic, Mainz - I thought I might land one of these jobs, but Rangers were the only one to even interview me! @numero uno gunner I don't think reputation is as simple as that. When I had the IGE a couple of seasons ago, there's 2 reputations, domestic and world. Plus it always does weird stuff like going down when you win a trophy and then quit (because of the quitting). We often refer to our reputation percentages, but I don't think they guarantee much of anything. My rep's at 60% (might even have been higher at one point) and I still can't even get an interview with any of the top Brazilian teams. I wonder to what extent out attributes (especially the hidden ones) affect our employment chances. South Africa 3-0 Nigeria (goals from Sihlangu, Masilela, Nxele) A good start although this was closer than the scoreline would suggest. South Africa 1-1 Ghana (goal from Dladla) probably should have won this one but a draw is not terrible. we took the lead through a great free kick from Dladla but couldn't hold on. South Africa 2-1 Libya (goals from Nkala, Sihlangu) I rested a few players and we actually went behind but came back to win which means we've topped the group. On to DR Congo in the next round! South Africa p0-0 DR Congo Well this was a bit lucky but we did deserve to win. My keeper Jousse managed to save their first 4 penalties in an incredible display to send us into a semi final against Egypt who I am pretty wary of. South Africa 5-2 Ghana (goals from Mokhele, Sihlangu, Motale, Dladla, Mlambo) instant resulted this but apparently we played pretty well. Well another failure, that makes it 8 attempts now. On a positive note, this one wasn't as gutting as previous editions. I think I may have become desensitised to whatever this competition throws at me. I think i'll stay with South Africa for another 2 years and see how we go next time as 2nd and 3rd is not bad at all compared to some of my previous attempts. I'd be tempted by the Tunisia or Egypt jobs as they both seem to have very good teams but we shall see. I might even try a new formation next time as my 4-4-2 obviously does not do the job here. Anyone have any formation advice for African success? @Fadedaf Unlucky Can't Believe It, Hope You Win It Next Time. 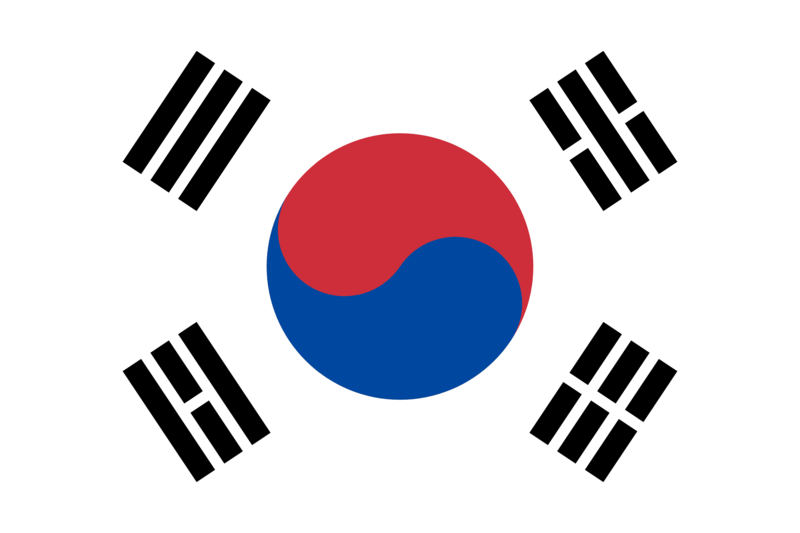 I'm still searching for a club job, but have taken on the South Korea job in the meantime. I'm seeing this as a 4 year project, with the aim of winning the Asian Nations Cup in 2035. With that in mind, I've decided that anyone who isn't likely to be around in 4 years time isn't getting selected, even if they're currently the best player in that position. Just a quick update really. We've just beaten China, Japan and North Korea comfortably enough to seal the East Asia Cup. Not exactly a career-defining trophy win, but its always a nice boost for team morale. This squad has a few really good players, so its going to be about building a team around them. We will qualify for the World Cup easily enough I imagine, so as long as I keep my job after the World Cup all should be good. Now, if anyone wants to give me a club job, I'd be very, very grateful! 2031 South Korea East Asia Cup winners! Well done to everyone on their progress! So after missing out on top spot by one point we went in to the play-offs against Telford. Following a 1-0 away win, I was concerned about the amount of missed chances in the first leg and was right to be as we folded in the home leg and went out 3-4 after extra time. Even though I more than exceeded the expectations of escaping relegation after taking over in October in 20th position and finishing 2nd a point below the champions, I'm absolutely gutted. Unsure as to stay and try a full season at Fylde or look for an escape route where possible. **Update** I moved to Southend United in League Two on June 7th. 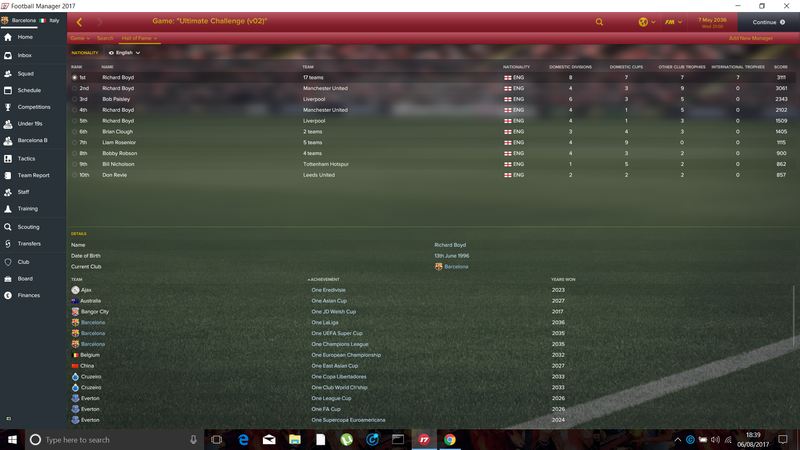 Hopefully the early change will give me enough time to mount a promotion bid despite the debt they have come down with. Decided to do this challenge. Was doing the San Marino one, but found out I couldn't manage the San Marino team because my settings weren't right. Anyway: I can use 'Susie real name fixes' right? They are database files, but only causes the game to use real names. Name fixes are fine, but it's always with keeping an eye on whether these files are causing any problems. I'm using one, and someone a few posts above mentioned a possible bug they cause with getting jobs, although getting new jobs is a pain for most of us, fixes or no. On that topic, I've finally landed a club job! It's the end of December, so thankfully a transfer window is about to open, as the squad is somewhat lacking in quality across the board. Right now though, a jobs a job! Took over as Mexico and NYFC manager, aiming to win the Gold Cup and also the MLS and then the North American Champions League. Dominance. We absolutely walked the league, a vast improvement on last year, mainly down to our away form improving hugely. We lost just the once all season, but the the thing I found most impressive was we won every home game, we really turned it into a fortress and made some of the "better" teams in the league look amateur. I didn't improve the squad an awful lot, mainly bought in a GK for the first team and the rest were squad options, but all the youngsters from the previous season were all a year older, had developed well, and really took to the challenge and propelled us to a higher level than the previous season. My top scorer with a superb 30 goals in all comp was a 17 year old who we got from our youth intake the previous season. We also went that one stage further this year, managing to win the domestic cup of South Africa, getting our revenge against Kaizer Chiefs from the previous seasons final. It was a relatively simple run, with only our local rivals Chippa Utd giving us a problem on the way, a game which went to a nervy penalty shootout. The team held their nerve though and went on to win the competition, another trophy for the cabinet. At the time I couldn't remember if this counted towards the challenge, so I wasn't entirely bothered about if we won this. In hindsight it did count, but then didn't matter as we won the Nedbank Cup anyway. Regardless, we won it. I used this competition to give gametime to my "Second Team" and again it was relatively simple, however I suppose we were rather lucky in all our games, except the final, being at home, where we were invincible. This really was a trophy I didn't care about, I used my second team in every game to give them gametime and if we won it, great, if we didn't, oh well. It was the only trophy we didn't win this season however, losing in the final to Wits, who seemed to get the better of us more than any other team in the league. It wasn't the best run, we only won one game, but it was early in the season and I don't think the team were quite in full flow by then. Alas, it's not going to be giving me sleepless nights not winning this. Well it seems we're now the team to beat in South Africa, making a clean sweep of all the major trophies in South Africa and winning a "tremendous treble". How can we improve? Well, we probably can't. I have some players leaving on frees as they want too much for a new contract, who's replacements I have already sorted out, however this could effect me in the Continental Competition, which has started very well for us, we're currently in the group stage. I was finally granted permission to do some coaching badges, finishing my National C Licence, and currently learning my National B Licence. The board also announced plans to build a new stadium, which due to our recent success, could be afforded straight from our own cash reserves without the need for a loan, which I thought was fanatastic, it increases our capacity by an extra 8000 or so fans. How close we will be to selling out though I don't know. Also, I got my first international job! I am now the manager of Algeria as you can probably see in the screenshots above, they did awfully in the ACON, I applied, and they offered me a job immediately. The squad is a lot weaker than I expected though, so I will have a hard time having success with them I feel, but then, stranger things have happened. I will obviously have to stay here until African Champions League is over at least, but I am just about ready to leave, so hopefully we can win it and I can move on to Asia. 18/19	        Mthatha Bucks	    1st		Winners of ABSA Premiership, winners of Nedbank Cup, winners of Telkom Knockout cup, group stage of African CL. New manager of Algeria. Another league / cup double. (The third in a row). We were unbeaten in the league with 27 wins and 3 draws, and 2 of those draws were after we’d won the league with a massive 6 matches to go. But I wasn’t here for the domestic trophies. I honestly thought that we were going to win the Libertadores, especially after we won a tricky quarter final against Flamingo who at the time were top of the Brazilian league. Champions for the last 2 seasons, Boca, had been knocked out. 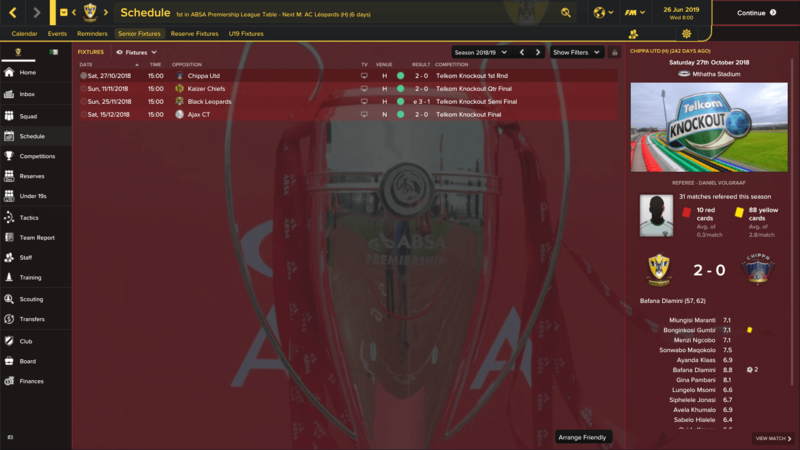 Our semi final was against Cruzeiro. We drew the first leg away from home 1-1, and we were set up for a final against Atlas,which I was pretty confident of winning. However the referee in the second leg handed out 5 yellow cards to us, and then one of my guys picked up a second yellow and we were down to 10 men. We were still ahead on away goals, and even a man down we went 1-0 ahead. Then we had a second player sent off, so I went ultra-defensive, and we almost pulled it off till they scored a scrappy and fluky equaliser in the 87th minute. I should have stuck with the ultra-defensive formation and taken my chances on a penalty shootout, but I swaped a defender for an attacker who was to be one of our penalty takers, and they scored a winner in the 2nd minute of extra time. I’m so annoyed, but as some of you may know, when I completed the Ultimate Challenge the first time, I won the Libertadores in my second match in charge of Corinthians, (taking over in between the two legs of the final). 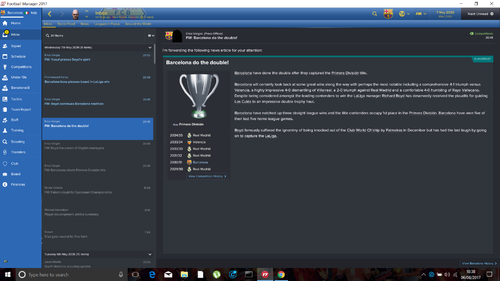 Also in the Dafuge-type S America small club to big, I won the Libertadores at the first attempt. So, I guess this is my penance, struggling to win it with Rosario Central and now with UdC. I can’t get a job in Brazil, but I really don’t want to manage there anyway, and my team really should win it next season. Only 1 player seems very keen to leave, and hopefully I could just about replace him with another foreigner anyway. Top Goalscorer – Carlos Muñoz -34. Carlos is getting a bit long in the tooth, (33), and I had a lot of rotation amongst the strikers, so he only started 31 matches. So not a bad tally. Best Average Rating Munoz 7.75. MVP – Again I have to bow to the numbers, even though my assistant manager rates him as the 14th best player at the club. 2022	U de Chile				1st		And another double. Lost in Lib S/F extra time after having 2 players sent off. 2021-	Nigeria					Qualified for ACON with perfect record. Anyway, I have something much more important coming up; the ACON with Nigeria. We won our qualifying matches (very easily), and we stand a good chance in the African lottery. Laptop up and running, back to Africa I go (I did think about starting elsewhere, but will need to get Africa done so why not get it out the way nice and early?) 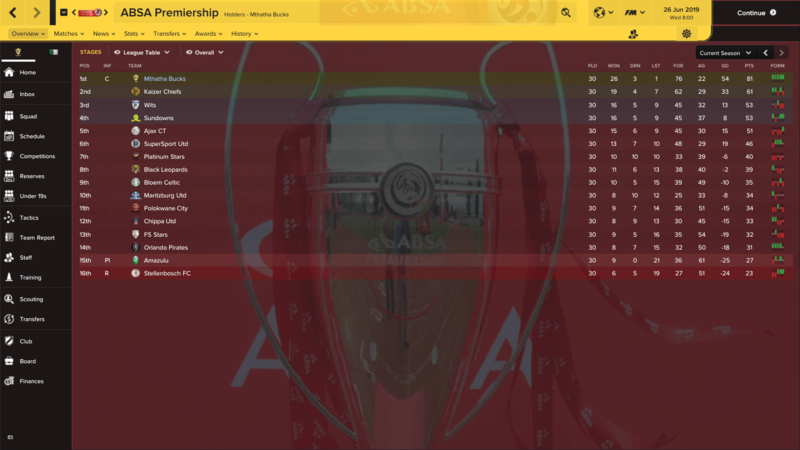 taking over at Thanda Royal Zulu, currently 12th, 9 points off the playoffs but with over half a season to go.